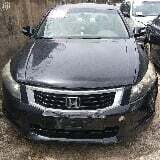 Honda Accord Discussion Continues For Quick Sale. Sound Engine And Gear Box, Factory Fitted Ac Working Very Well, Brand New Tires. Vehicle Used By Me From Brand New. Bought Brand New In Nigeria From Honda Place. We Just Got A Landcruiser Thats Why We Are Selling. Sharp And Sound Honda Civic 2004 Model For A Lucky User, Rush Now For Inspection And Payment In Jabi, Abuja. Honda Cr-V 1997 Automatic Transmission Nigerian Used Car For Sale, Vehicle Is Still In Good Working Condition. The Car Is In Good Condition, All Car Documents Are Current And Registered. Ac Chilling. Just Buy And Drive. Grab This Offer Now!